This one is inspired by one of my most unsuccessful wildfowling trips ever. I went out with a friend who conjured the idea of a four-mile paddle in a Canadian canoe out to the marsh, pre dawn, against tide and wind. I was knackerd by the time we got there but persevered we did, and did not come back empty handed. I shot one teal and a snipe. And thus was the birth of my mini two-bird roast. The most complicated part is boning the teal. Start from the back and work your way around the carcass. Leave the wings and legs with the meat. Lay the teal out flat, skin side down. Then remove the breasts from the snipe (these are surprisingly big considering the size of the bird). Lay them in the center of the laid out teal. Roll the teal around the snipe breasts. Make this as tight as possible. Then wrap the teal-snipe sausage you’ve already made, with the streaky bacon. Once done, place on a roasting tray in a hot oven around 180c, bottom of the top oven of an AGA or Raybern, 356F, gas mark 5/6, or around 15 to 20 minutes. Don’t overdo them – pink is good. 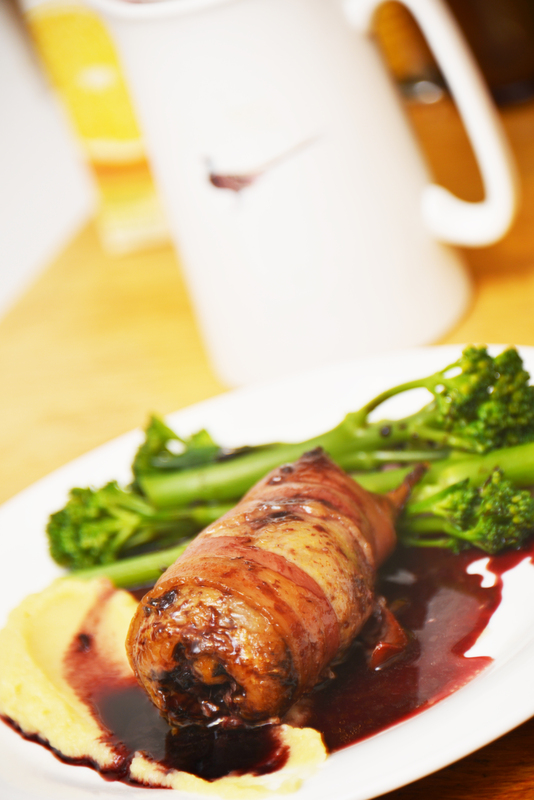 Serve with steamed broccoli, parsnip puree and a red win jus (made with the juices from the roast).